Pinch me. 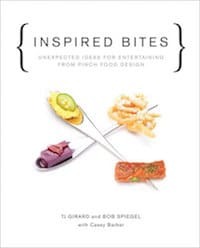 After a year and a half spent working with TJ Girard and Bob Spiegel, co-owners of the New York catering company Pinch Food Design, the eye-popping cookbook Inspired Bites: Unexpected Ideas for Entertaining from Pinch Food Design is in stores and ready for the public to take home. And I’m ready to celebrate with a drink. Sound too ambitious for a humble at-home event? Not necessarily. Though Pinch works in the world of chic NYC galas, serving hundreds of hungry, well-heeled partygoers, everything in Inspired Bites has been scaled down to a manageable size. 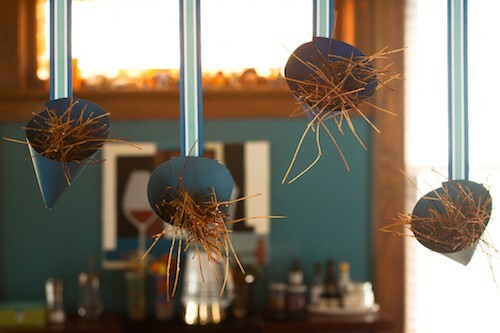 DIY enthusiasts will have a field day with the ideas and projects explored in Inspired Bites. If you want to go all out for Thanksgiving this year, you could create a long, boxed-in table runner filled with marbles, sliding plates up and down the table like they were on ball bearings. Or you could keep guests mingling before the meal with nibbles hung from ribbons and paper cones at eye level. Note: the cocktail mix might taste too strongly of vodka when you first stir it together, but remember that it’s designed to be served over ice—it dilutes down to just the right consistency when served. Stir the sugar and water together in a saucepan over medium heat. Cook, stirring occasionally, until the sugar dissolves completely and the syrup comes to a simmer. Stir in the sage leaves and remove from the heat. Cover and let steep for 1 hour to let the sage flavor infuse the syrup. Remove the sage leaves from the syrup. Add ice to the pitcher or dispenser. Set up a drinks station with highball glasses, additional ice, ginger beer, and the ginger slices and additional sage leaves for garnish. 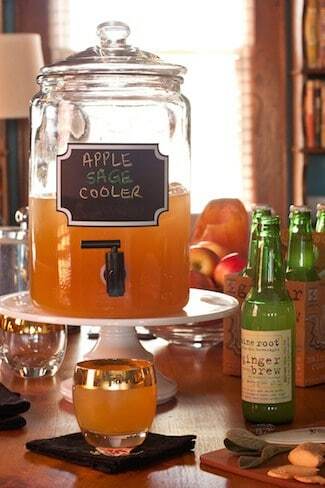 Let guests fill their glasses with ice, serve themselves from the dispenser, add a splash of ginger beer to the drink, and garnish with ginger and sage.